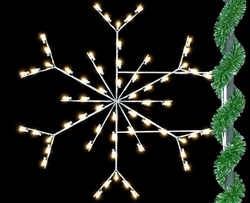 6' Silhouette Forked Snowflake Pole Mount with C7 LED 80,000 hour bulbs. Installation hardware included with 8' lead cord. 5 Season warranty on frame and 3 seasons on LED bulbs. Proudly made in the USA. 3' Forked Snowflake has (36) C7 LED bulbs weighs 12 lbs. 4' Forked Snowflake has (54) C7 LED bulbs weighs 14 lbs. 5' Forked Snowflake has (60) C7 LED bulbs weighs 16 lbs. 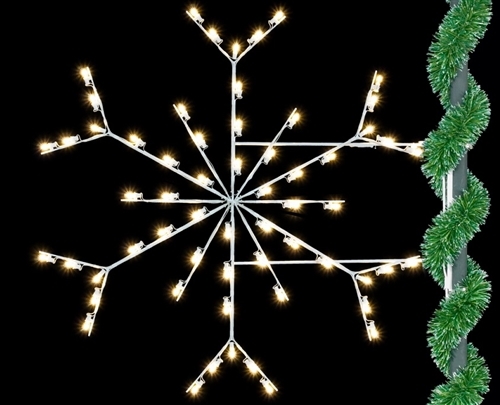 6' Forked Snowflake has (72) C7 LED bulbs weighs 20 lbs. We can make larger sizes, just call us for pricing. Call for shipping rates anywhere in the world. Allow 2 to 3 weeks manufacturing time.